Comes from a nice family including multiple Listed winner Sobriety and Gr.2 winner Starlarks. 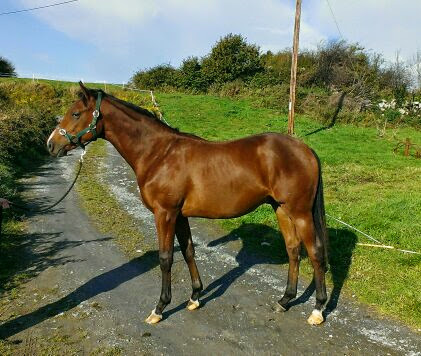 Ondamoura (IRE) (2012 c. by Intense Focus (USA)): unraced to date. SOBRIETY (IRE) (g. by Namaqualand (USA)): 6 wins at 2 to 5 years at home and in Hong Kong and £1,246,277 inc. Hong Kong Derby, Sha Tin, L., Hong Kong Gold Cup, Sha Tin, L. and The Centenary Vase, Sha Tin, L., placed 3rd Peugeot Gordon S., Goodwood, Gr.3, Hong Kong Gold Cup, Sha Tin, L. and ING Hong Kong Champions & Chater Cup, Sha Tin, L.
STARLARKS (IRE): 4 wins at 2 and 3 years at home and in U.S.A. and £169,184 inc. San Clemente H., Del Mar, Gr.2, placed 2nd La Brea S., Santa Anita, Gr.1 and 3rd Harold C Ramser Sr H., Santa Anita, Gr.3. Visenya (GB): winner at 3 years, 2013 abroad. Branson (IRE): 2 wins 2014 abroad and £16,068. Lenora's Charm (USA): winner in U.S.A.; dam of DOCKET COURT (USA): 6 wins at 2, 3 and 5 years inc. Northlands Oaks, Northlands Park, Princess Margaret S., Northlands Park and Assiniboia Oaks, Assiniboia Downs, 3rd Bird of Pay S., Northlands Park, L.; grandam of Bubba Sly (USA): 4 wins at 2, 4 and 5 years in Canada, 2nd Birdcatcher S., Northlands Park. Saratoga Moon (USA): unraced; dam of SPLITFIRE (PER): won Clasico Ciudad de Lima, Hipo Monterrico, Gr.2 and C. Asoc. Prop. Caballos Carrera del Peru, Hipo Monterrico, Gr.2, 3rd Gran Premio Nacional-Augusto B Leguia, Hipo Monterrico, Gr.1 and GP.Asoc. Latinoamericana de Jockey Clubs, Hipo Monterrico, Gr.1, SAMARA (PER): winner in Peru, Clasico Tex Fina, Hipo Monterrico, Gr.3, DAYEV (USA): won Silver Spur H., Trinity Meadows and Chick Lang Jr. Memorial H., Retama Park, Magia (PER): winner in Peru, 2nd Clasico Cesar A del Rio Suito, Hipo Monterrico, L. and 3rd C. Mariano Ignacio Prado y Ugarteche, Hipo Monterrico, Gr.2, Muchacho Malo (PER): winner in Peru 2nd Clasico Postin, Hipo Monterrico, Gr.2; grandam of BRADOCK (PER): won GP.Asoc.Latinoamericana de Jockey Clubes, San Isidro, Gr.1, 2nd Clasico Derby Nacional, Hipo Monterrico, Gr.1 and 3rd Polla de Potrillos (2000 Gns)-R.A.C.Rey, Hipo Monterrico, Gr.1, Silver Wind (PER): winner in Peru and in U.S.A. 3rd Clasico Coronel Francisco Bolognesi, Hipo Monterrico, Gr.3, Pratz (PER): winner in Peru 2nd Clasico Enrique Meiggs, Hipo Monterrico, Gr.3, Corazon De Leon (PER): winner in Peru, 3rd Clasico Ciudad de Lima, Hipo Monterrico, Gr.2. North Buchan: 6 wins: winner at 3 years; also 5 wins in France and in West Germany, 2nd Hitchcock-Memorial, Koln, L. and Oleander-Rennen, Baden-Baden, L.; sire.